Since the beginning, which incidentally wasn't that long ago, you've had major dreams for your infant traveling the world. The thing is, you didn't think that travel bug would take hold quite so early or so come in in such an extreme way.Then NASA called, you aren't sure how they got your number but they did and you can't deny your little adventurer a trip to space. As soon as they started to moon walk you knew life might pan out a bit differently for this kid. Then maps of the stars drawn in crayon starting showing up on your walls. When space beckons to your baby it's an impossible call to ignore. Who knows how the baby monitor didn't pick up those midnight interviews with the space program recruiter, as far as you knew your kid wasn't even talking yet! Now your youngster is spending time a lot of time in that anti-gravity chamber, which you hear is a lot like the womb so it's pretty familiar setting to your baby. It won't be long until the rocket is ready to launch and you're getting a little nervous. 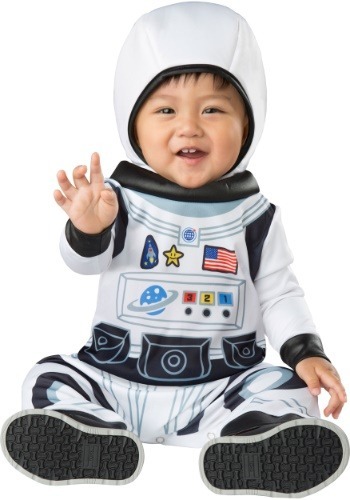 At least your infant looks completely adorable in that little spacesuit! With a soft fabric and printed on tech, NASA was able to make those heavy spacesuits child friendly. Even the helmet is comfy with soft foam so your child can easily nap after take-off. You should see if you can tag along for the journey, lucky for you adult sizes in spacesuits can be found on our site so you can supervise baby's first orbit. Just don't forget your kid's favorite blanket or Houston is really going to have a problem.